It's definitely one of my favorite Dreamworks movies. Though consistently funny and enjoyable, Megamind is essentially average. [Megamind] has splendid visuals, a good story, and enough witty dialogue to turn it into an enjoyable experience that's worth checking out. It may not raise the bar of this rapidly developing genre, but it manages to pack a lot of fun and spectacle into its running time. It does have the odd cheeky nod for the grown-ups -- and it is presented in inglorious 3D -- but it's also got a screenplay overflowing with charm, intelligence, wit and a real spark. Would be lost in the crowd, perhaps deservedly so, if it didn't pull aces on its execution. If you have to choose between this and the superficially similar Despicable Me, choose Megamind. It's less predictable, funnier, cleverer and generally more enjoyable. This is a harmless animated movie that's full of empty laughs. The main problem with all those empty laughs is that they arrive wrapped in a package you've seen before, probably even if you're still a kid. Hardly a knockout, but Megamind is an immensely enjoyable animated adventure that spoofs and pays homage to the superhero genre. There's a distinctly deflated ambiance to the shenanigans, leaving the picture serious eye-candy on the prowl for bellylaughs it infuriatingly never finds. Megamind is dramatically and comedically inert. ...often shrewd, colorful, witty, and well animated, I found it oddly flat, too. Straying from a predictable, easily defined structure, Megamind instead serves up consistent surprises, challenging audience expectations and engaging the mind as well as tickling the funny bone. 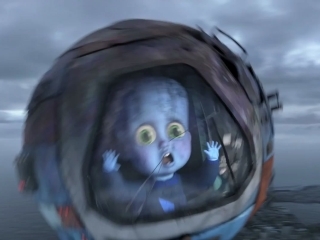 Falling short of a mind-blowing experience, Megamind is still fine family entertainment that doesn't require deep thinking. Its story's third-act inversions still provide a pointed rebuke to superhero narratives' set-in-stone dynamics. What it lacks in originality, this wickedly funny take on a superhero villain makes up for in a multi-layered plot, terrific voicing and well balanced energy. What is a villain if not someone who has been pushed too far in life and has started to push back? And with nothing to push against, what do they become? 'Megamind' may not be thought-provoking, but it is fun. And, come to think of it, it does give us something to ponder along the nature-or-nurture concepts of destiny.